My go-to method of staying in contact with both students and parents is Celly. For Celly to be most effective, I have found that you need to have everything set-up BEFORE the school year starts. If you're reading this and the year has already started, FEAR NOT! Celly can still work for you. Essentially, it works by you setting up what they call "cells". A cell is like a social network for your classroom or for your school. Cells can be any size and will work on any device. Once the cell is created, the members can communicate and collaborate. The reason they work best for schools is that they are totally private. No one in the cell knows your phone number or contact information and you don't know theirs. Members can use a variety of platforms to join, such as messaging, email, app, or web. It has been a huge time-saver for me because I can schedule messages to go out whenever I want. For example, I have a weekly homework assignment that the students receive on Monday that is due no later than Friday. I have an automatic message to go out every Thursday afternoon that reminds students and parents that their homework is due the following day. I create a "cell" for each class which allows me the flexibility in sending messages to only specific classes, instead of all of my students. Parents love it because it keeps them informed on what's happening in my class and it stimulates conversations at home between parents and their children. "Did you turn in your weekly homework yet?" Did you get a study guide for Tuesday's test? Let's review together!" Side Note: I got a notice that some things will be changing with Celly on July 28, 2016. Not exactly sure how this will effect what I do (or if I even use it still), so just wanted to give you a heads up. But just in case things go awry with Celly, this is my new fave! Class Messenger looks awesome. I might just switch to it because of its pure awesomeness. It allows for private 2-way messaging for grades K-12. It is available online, iOS app, and Android app, sending messages to mobile apps and email. I just set up my account and it was super simple- it even gave me the option of setting up a temporary "fake class" so that I could play around with the app as both a teacher and a parent. It gave me a good idea of how it works for everyone involved. 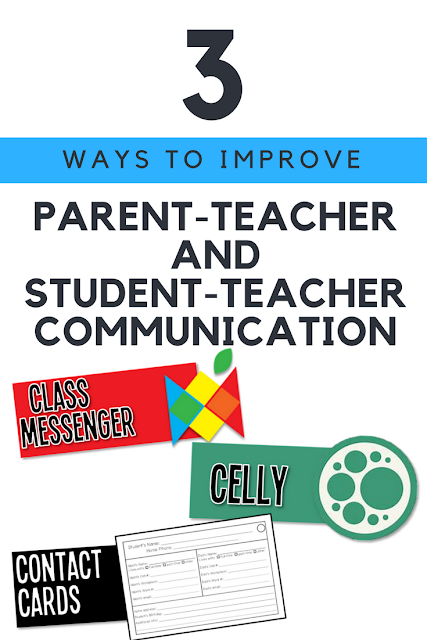 Class Messenger gives more communication options, allowing teachers to message parents or students, parents to message parents (great for class parties, volunteers, and other activities), and teachers to teachers and administrators (there are special groups you can set up that are called "staffrooms"). Students CANNOT message anyone but the teachers. And all communications take place without sharing emails or phone numbers. And just in case you are worried about people "bothering" you at home or during certain hours, Class Messenger has a Do Not Disturb feature which gives you the freedom to decide when you don't want to be bothered. For example, you could set it to turn off the push notifications and email from 5:30 pm - 7:20 am each day, as well as having the weekends off. You can send out surveys (no more SurveyMonkey, my friends), order forms, ask for donations, volunteers, and meeting notifications. They have a really neat, time-saving feature called "Intelligent Messaging" that can follow up ONLY with people who haven't responded, RSVP'd, or submitted something that you needed by the due date. Multiple pictures and documents can be attached to the messages you send out and messages can be scheduled and repeated. The mobile apps come with Dropbox and Google Drive integration. I can see great benefit to using this feature with my middle school students. It would be so simple to attach the homework assignment or study guide to a message that I sent out to get greater participation and help students meet due dates. So often I get the excuse that a student didn't do their homework because they forgot it at school or lost it. NO MORE EXCUSES! In most cases, individuals will sign-up up on their own, but you have the option, as the teacher, to add people. This is obviously a little more time consuming for you since you would have to type in all of their info, but we all know that there always a handful who just don't "get the memo." If you don't have 100% coverage, the communication just won't be as effective. If you are an elementary teacher or you set up teacher conferences each year, the Timeslot Meeting feature will do all of the work for you. Simply create up to 60 timeslots with different days, start times, and meeting lengths and send out the notification to certain groups. Parents, students, or teachers can pick the time that's right for them. Once the slot is picked, no one else can choose it. And if you have any non-responders, the "Intelligent Messaging" will take care of following up with them, so that you don't have to. To check out their Prezi, CLICK HERE or if you'd rather see this as a PDF, CLICK HERE. To get your entire school on Class Messenger, CLICK HERE for more info. Access the Quick Reference Guide for Parents HERE and a Parent Handout HERE. All of this new technology is great, but sometimes you just can't beat regular ole' pen and paper. If there is a system that is more efficient, then I say "USE IT!" The Parent Contact Cards are just that for me. During the first few days of school, I have each of my students take home a blank parent contact card for their parent or guardian to fill out and return to me. I punch a hole in the top corner and attach them to a binder ring. I make a different ring for each class period and keep them right behind my teacher desk, which is also near my telephone. Anytime I need to make quick parent contact, I just grab the cards and I'm ready to go. It can't get simpler or more efficient. What are some tips you have for improving communication? We came across your blog, and these are great tips! Thanks for sharing. We're very pleased to have stumbled across Science Teaching Junkie, and we can't wait to read more of your posts in the future. These are awesome! I've heard of celly, but not class messenger. Will check that out. My son's class uses BLOOMZ and that seems pretty good too. They just seem to continually outdo each other. I love technology that makes my life easier! Thanks, Tara!